Madison County, Illinois; 1884. Courtesy of Kelly Miller-Collins. 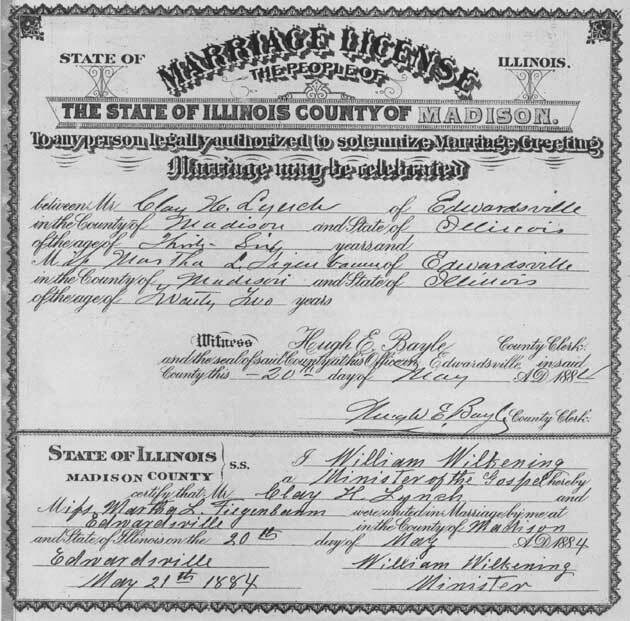 The marriage license issued on 20 May 1884 by Madison County in the State of Illinois authorized a marriage between Clay H. Lynch of Edwardsville, Madison County, Illinois, of the age of thirty-six, and Martha L. Fiegenbaum of Edwardsville, Madison County, Illinois, of the age of twenty-two. The form at the bottom of the document certified that William Wilkening, a Minister of the Gospel, did unite in marriage Mr. Clay H. Lynch and Miss. Martha L. Fiegenbaum at Edwardsville, Madison County, Illinois on 20 May 1884. Rev. Wilkening signed the certificate on 21 May 1884. The Return of a Marriage to County Clerk on the back of the marriage license recorded details of the bride and groom. Apart from signatures, the handwritting in this section appears to that of Clay Lynch. The groom's name was Clay Hardin Lynch; a resident of Edwardsville, Illinois. He was an "Attorney at Law." He would be 37 years old at his next birthday. His color was white and his race was "American." He had been born in Madison County, Illinois. His father was John Lynch; his mother was Sallie Lanterman. This was his first marriage. The bride's name was Martha L. Fiegenbaum; a resident of Edwardsville, Illinois. She would be 23 years old at his next birthday. Her color was white and her race was "German." She was born in Minnesota. Her father was William Fiegenbaum; her mother was Sophia Gusewelle. This was her first marriage. 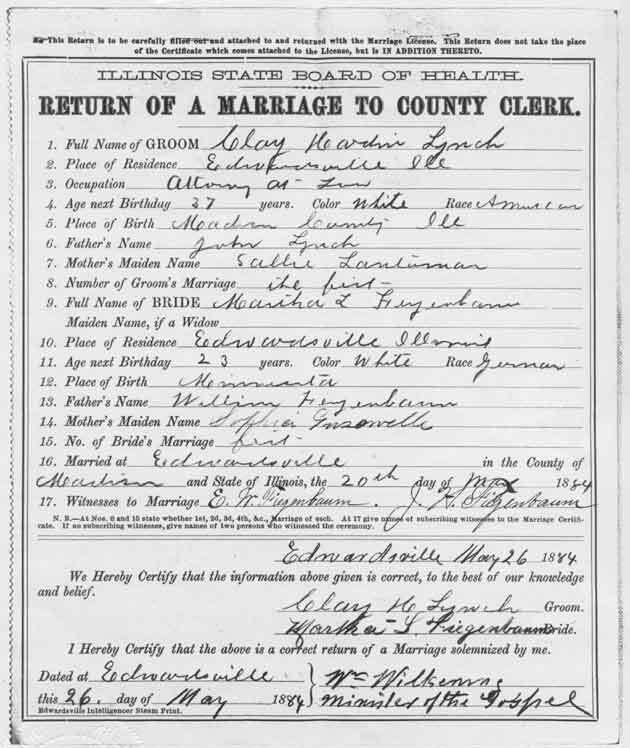 The marriage took place at Edwardsville, Madison County, Illinois on 20 May 1884. The witnesses to the marrriage, E. W. Fiegenbaum and J. H. Fiegenbaum, signed their names. At the bottom of the back side of the license, dated 26 May 1844, Clay H. Lynch, the groom, and Martha L. Fiegenbaum, the bride, signed their names, certifying the information supplied. On the same day, Wm. Wilkening, Minister of the Gospel, also certified the correctness of the return. It is virtually certain that the witnesses to the wedding ceremony were two of the bride's brothers – Edward William Fiegenbaum and Julius Henry Fiegenbaum.